The new novel from the bestselling author of You Had Me At Hello. Anna Alessi - history expert, possessor of a lot of hair and an occasionally filthy mouth - seeks nice man for intelligent conversation and Mills & Boon moments. Despite the oddballs that keep turning up on her dates, Anna couldn't be happier. As a 30-something with a job she loves, life has turned out better than she dared dream. However, things weren't always this way, and her years spent as the 'Italian Galleon' of an East London comprehensive are ones she'd rather forget. So when James Fraser - the architect of Anna's final humiliation at school - walks back into her life, her world is turned upside down. But James seems a changed man. Polite. Mature. Funny, even. People can change, right? So why does Anna feel like she's a fool to trust him? 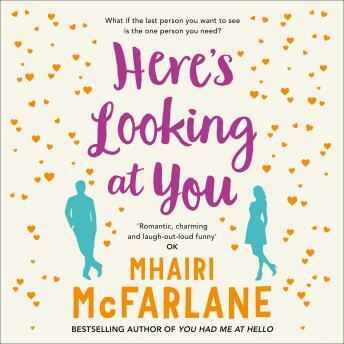 Hilarious and poignant, 'Here's Looking At You' will have you laughing one minute and crying the next. The new must-read novel from #1 bestseller Mhairi McFarlane.